Just why do cats eat grass? This behavior may look rather strange, but in fact a cat eating grass is really quite normal. Cats seem to be genetically programmed to eat plant material and those kept indoors and deprived of the ability to do so will wreak havoc with your best houseplants, given half a chance! There are a few theories that aim to explain this. Hmm ... why do cats eat grass? The most usual reason given for cats eating grass is that it helps them to get rid of hairballs in their stomachs by making them vomit. A cat's tongue is covered in hundreds of little barbs which act like combs, catching the fur as the cat grooms itself.This hair is then swallowed and it gets turned into matted, furry balls in the stomach. The theory is that the grass mixes with the hairball and makes it easier to expel. As hairballs are quite indigestible this seems very logical, but a cat will often vomit after eating plant material whether or not it has hairballs. So it could be that cats eat grass whenever they feel unwell in order to help them get rid of anything that might make them ill, whether it's a hairball or some other form of toxic matter. Special note: If your cat vomits frequently, do have him checked out by your vet, just in case there's any serious underlying reason for this. 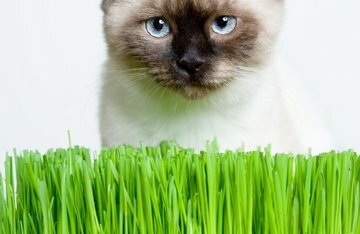 As any cat owner knows, eating grass doesn't always make a cat vomit - plant stems can often be seen in cat feces, too, so it must sometimes pass all the way through to the other end. Then perhaps it's a herbal laxative? It could be that a cat eats grass to help it clear out its bowels. A constipated cat will often eat grass which then mixes with its stools, making these easier to pass. This may also be another way of clearing out hairballs that manage to get down into the lower intestines. The zoologist Desmond Morris, in his classic book Catwatching (a must for any cat owner, though it's quite an old book now), says that a cat may eat grass for the folic acid it contains. Folic acid is a vitamin (one of the family of B vitamins) that, among other things, helps to create healthy red blood cells and prevent anemia. Folic acid is found in all plant leaves, so this is a plausible explanation. For humans, a good source of folic acid is liver, and a cat in the wild will first eat the offal (liver, kidneys, intestines) of its prey – probably because these are chock-full of all the nutrients consumed by their plant-eating prey. These days, our domestic felines may not eat much offal in their diet, so this could provide further support for the folic acid theory. Whatever the reason, cats do seem to have a need to eat grass. An outdoor cat will do this naturally as it patrols its territory, but if you have cats that don't go outside, why not provide them with their own indoor garden? You can buy lawn seeds from all garden centers, and some pet stores also sell grass kits especially designed for cats to eat. Why not give it a try? At the very least it might help to preserve your expensive houseplants! So why do cats eat grass? Have we found an answer? It's possible that no-one really knows yet why this happens, it could be one of those 'evergreen' mysteries ... but it's really quite harmless, and it does seem to be a necessary behavior, so there's no need to worry. Top of "Why Do Cats Eat Grass?"